Author(s): Kathrin M. Scherer, MRC Laboratory for Molecular Cell Biology (LMCB), Faculty of Life Sciences, University College London,, United Kingdom	Roger H. Bisby, Stanley W. Botchway, United Kingdom	Anthony W. Parker. Photodynamic therapy (PDT) is an alternative cancer treatment to conventional surgery, radiotherapy and chemotherapy. It is based on activating a drug with light that triggers the generation of cytotoxic species that promote tumour cell killing. At present, PDT is mainly used in the treatment of wet age-related macular degeneration, for precancerous conditions of the skin (e.g. actinic keratosis) and in the palliative care of advanced cancers, for instance of the bladder or the oesophagus. PDT is still not used as a first line cancer treatment, which is surprising given the first clinical trials by Dougherty’s group dating back to the 1970’s. PDT has significant advantages over surgery or radiation therapy for low lying tumours due to better cosmetic outcome and localised treatment for the patients. 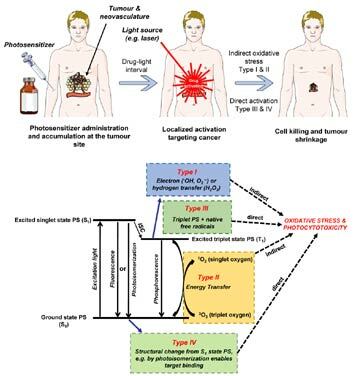 However, despite these advantages and significant developments in optical technology that has enabled light penetration to deeper lying tumours, in excess of 5 cm, a lack of phase III clinical trials has slowed down the uptake of PDT by the healthcare sector as a frontline treatment in cancer. However research continues to demonstrate the potential benefits of PDT and the need to stimulate funding and uptake of clinical studies using next generation photosensitizers offering advanced targeted delivery, improved photodynamic dose combined with modern light delivery technologies. This review surveys the available PDT treatments and emerging novel developments in the field with a particular focus on two-photon techniques that are anticipated to improve the effectiveness of PDT in tissues at depth and on next generation drugs that work without the need of the presence of oxygen for photosensitization making them effective where hypoxia has taken hold. Keywords: Photodynamic therapy (PDT), photosensitizer, two-photon, combretastatin, anticancer, Type IV. Keywords:Photodynamic therapy (PDT), photosensitizer, two-photon, combretastatin, anticancer, Type IV. Abstract:Photodynamic therapy (PDT) is an alternative cancer treatment to conventional surgery, radiotherapy and chemotherapy. It is based on activating a drug with light that triggers the generation of cytotoxic species that promote tumour cell killing. At present, PDT is mainly used in the treatment of wet age-related macular degeneration, for precancerous conditions of the skin (e.g. actinic keratosis) and in the palliative care of advanced cancers, for instance of the bladder or the oesophagus. PDT is still not used as a first line cancer treatment, which is surprising given the first clinical trials by Dougherty’s group dating back to the 1970’s. PDT has significant advantages over surgery or radiation therapy for low lying tumours due to better cosmetic outcome and localised treatment for the patients. However, despite these advantages and significant developments in optical technology that has enabled light penetration to deeper lying tumours, in excess of 5 cm, a lack of phase III clinical trials has slowed down the uptake of PDT by the healthcare sector as a frontline treatment in cancer. However research continues to demonstrate the potential benefits of PDT and the need to stimulate funding and uptake of clinical studies using next generation photosensitizers offering advanced targeted delivery, improved photodynamic dose combined with modern light delivery technologies. This review surveys the available PDT treatments and emerging novel developments in the field with a particular focus on two-photon techniques that are anticipated to improve the effectiveness of PDT in tissues at depth and on next generation drugs that work without the need of the presence of oxygen for photosensitization making them effective where hypoxia has taken hold.